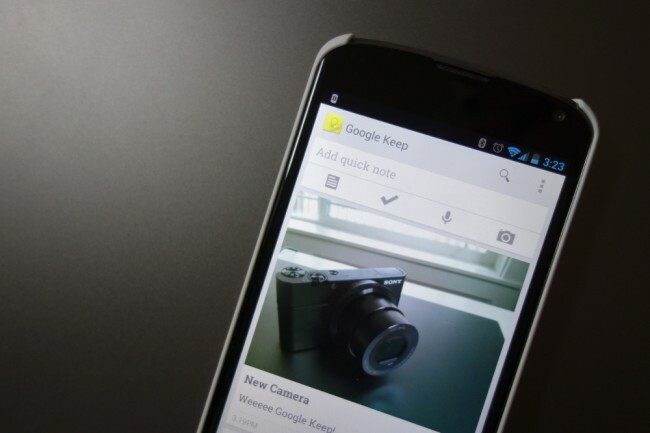 Google Keep was announced and then released a couple of hours ago as Google’s take on a note taking app that can compete with the likes of Evernote and others. It has the same Holo style UI we’ve seen from many of their apps, is easy to navigate, and comes with an amazing little widget. We aren’t sure if it can overtake Evernote’s stranglehold on the note market, but it’s showing signs of being very promising after just a few minutes with it. With Google Keep, you can take notes in the traditional sense by typing them out or you can use your voice to dictate them. Taking that idea a step further, as you dictate an app with your voice, Keep will also attach a sound file that can be played back later. If sound and typing isn’t your thing, your camera can be used to create notes or enhance others, as well. Last, you can share items like web pages with Keep just as you do with other services. But that’s not all. Keep works in the web through Google Drive, so your notes from your phone are synced with those in the web and vice versa. In fact, as you type a note through the web app, you’ll see it populate the Keep app on your phone or tablet in real time. It’s pretty neat. To catch the app in action, hit up our video below.